We will have monthly meetings for most of the year. Come on time and be prepared for the meeting. Listen to the speakers and participate in any hands-on activities. Refrain from talking to those sitting by you while there is a presenter speaking. 5/1/19 – Garrison Fire Department Raffle tickets and money (sold & unsold) are due back to Anderson Cleaners by 5pm. The registration fee is $75. This includes your team jersey, annual SATT and TBF memberships and club sponsorsed tournament fees. We will have ongoing fishing contests during the year. Details will be made available for each contest. ​We will have team fundraising and community volunteering events throughout the year. These will be announced with as much advanced notice as possible. Watch your email and check the website for these announcements. These events are not only to raise money for our team but give back to the community and businesses that have supported us! Attend registration meeting and complete registration form and pay registration fee. Attend as many monthly meetings as possible. Attend a minimum of 2 tournaments per year. Volunteer for a minimum of 1 event per year. Respond to email communication as needed. 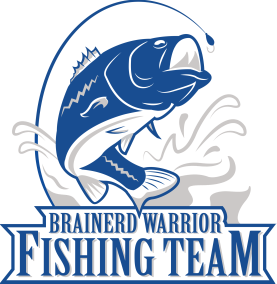 Represent the Brainerd Warrior Fishing team in a professional manner. Use boater safety skills on and off the water. Be respectful to others and others property always. Be prepared for all types of weather at an event. We are in an area where the weather can change from one extreme to the next in a very short period. Be sure to have food and drinks for the tournaments with you. Maintain satisfactory grades in school. ​We are always looking for boat captains that are willing to volunteer their time and use their boats to bring angler’s fishing. If you know someone who is willing to volunteer have them contact us or give us their name and number and we will contact them. Fill out our online form.